As you will see, Christians have chosen to ignore the red flags which is the reason DeYoung felt it necessary to tackle yet another fad embraced by professing evangelicals. “Recently on Oprah and Friends, Dr. Oz Mehmet talked with Father Richard Rohr about “helping people find deeper spiritual enlightenment by gaining a greater understanding of their personality through the Enneagram personality system, an ancient tool that explains how human personality works” . If you haven’t heard of the Enneagram yet, it won’t be long before you do. After being used for several decades in Catholic retreats and seminars, the nine-type personality tool has seen an explosion of popularity in evangelical circles. Since 2016, evangelical publishers have released at least three-full length books on the Enneagram: The Road Back to You: An Enneagram Journey to Self-Discovery (IVP 2016), The Sacred Enneagram: Finding Your Unique Path to Spiritual Growth (Zondervan 2017), and Mirror for the Soul: A Christian Guide to the Enneagram (IVP 2017). A new book—The Path Between Us: An Enneagram Journey to Healthy Relationships (IVP)—is set to release in April. Beyond books, the Enneagram (pronounced any-a-gram) continues to receive a warm reception on a number of blogs and evangelical media outlets with articles like: “What All Christians Need to Know About the Enneagram” and “The Never Ending Quest to Know Ourselves.” In particular, Christianity Today has been a frequent advocate of the Enneagram, touting what the Enneagram has to offer Christians, how evangelicals can use it, and, just recently, how it can be a tool for pastors. On a personal note, I have good friends who swear by the Enneagram as the means by which God showed them their blindspots and helped them overcome weaknesses in their personality. So what should we make of this new (or ancient?) personality wheel with a strange name? I want to get at the question in a simple, straightforward—and admittedly limited—way. I’m going to look at The Road Back to You by Ian Morgan Cron and Suzanne Stabile. I’ve chosen this book for several reasons: it was the first one (so far as I know) to come out with an evangelical publisher, it has been successful enough to spawn a soon-to-be-released sequel, and its authors are popular experts on all things Enneagram. I understand that some fans of the Enneagram will say, “But that’s not what I believe!” Or, “That’s not how I use it!” I get that. It’s a tool that can be adopted and adapted to a variety of theologies and contexts. But you have to start somewhere, and The Road Back to Youseems as good a place as any to dive in and interact with this increasingly popular tool of self-discovery. Hereafter in this post, my analysis with the Enneagram will be through reviewing this single book. Ok, enough preface. What are we actually talking about? 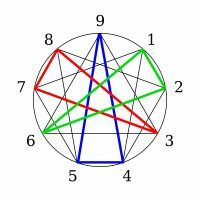 While the ancient roots of the Enneagram are sketchy—maybe it started with a monk, maybe with with Sufism, maybe with occult practices—most everyone agrees that the modern Enneagram entered America by way of the psychiatrist Claudio Naranjo, a student of a Chilean named Oscar Ichazo who rediscovered the Enneagram in the early 1970s. From Naranjo, the Enneagram entered the Catholic world through Father Robert Ochs, and then later made another splash when the Franciscan Friar Richard Rohr began writing and speaking on it (10-14). At first glance, the Enneagram may look like just another personality test, along the lines of discovering your Myers-Briggs type, knowing the color of your parachute, finding your strengths, or realizing you’re a golden retriever instead of a beaver. But Cron and Stabile are adamant that the Enneagram is much more than a psychological profile. “The true purpose of the Enneagram is to reveal to you your shadow side and offer spiritual counsel on how to open it to the transformative light of grace” (31). Growing up, we learn to cope with the emotional wounds we receive in childhood. In order to protect us from pain, we “place a mask called personality over parts of our authentic self” (22). The Enneagram is not the end-all and be-all of Christian spirituality, Cron and Stabile acknowledge, but it is an incredibly useful tool God can use to help restore us to our authentic selves (20, 23). “Buried in the deepest precincts of being,” Cron writes, “I sense there’s a truer, more luminous expression of myself, and that as long as I remain estranged from it I will never feel fully alive or whole” (23). At its root, the Enneagram is a healing message of self-knowledge and self-awareness (34). We all put on masks. We all struggle to feel like we are okay in the world and okay to be who we are. Enter the Enneagram as a tool for letting go of the stranger we’ve become (24). “The purpose of the Enneagram is to show us how we can release the paralyzing arthritic grip we’ve kept on old, self-defeating ways of living so we can open ourselves to experiencing more interior freedom and become our best selves” (36). Each of us has one of nine, fixed personality types (ennea being the Greek word for “nine”). Cron and Stabile label the nine types: (1) the perfectionist, (2) the helper, (3) the performer, (4) the romantic, (5) the investigator, (6) the loyalist, (7) the enthusiast, (8) the challenger, and (9) the peacemaker. Each personality type, in turn, belongs to a particular triad (related to your head, heart, or gut), has wing numbers (leaning into other types), stress numbers (the bad qualities you pick up when you’re unhealthy), and security numbers (the good qualities you pick up when you’re healthy). The bulk of the book moves through each type (not in order), explaining what these people are like, what famous people are like them, what they need to confront in themselves, and how each of us needs the grace of God to learn to be okay with our true self. The book is written in Cron’s voice with Stabile’s Enneagram expertise in the background. Cron is a good writer—clear, funny, informative, and entertaining. I also appreciate how the book takes seriously our need to change. This is NOT a book that says you are fine just the way you are. Your personality type may be fine, and your true self may be luminous, but the way we all act is tainted with unhealthy habits. Cron and Stabile want us to stop hurting people, including ourselves. That’s commendable. More to the point, I don’t doubt that many people can learn useful things about themselves and others from the Enneagram. I always find that books like this have a few good commonsense nuggets of truth. I’ve done Myers-Briggs, DISC, spiritual gifts inventories, spiritual temperament books, strength finders, and a smattering of other self-discovery books and tests. It can be helpful to realize that you are driven to succeed, or that your co-worker hates conflict, or that your spouse is an adventurous romantic. When put in their proper place, there’s something to learn from the find-your-personality literature. And yet, on the whole, The Road Back to You is bound to be more harmful than helpful. Let me mention three criticisms, finishing with the most serious. First, the Enneagram, as presented in this book, is far less revolutionary than most proponents would have you believe. I have to admit I found the whole thing tedious and formulaic. If you offer a one-sentence description of each number to a thoughtful, mature adult, I bet he could pretty well describe each type without any knowledge of the Enneagram. There’s only so many ways to skin a cat. We’re all sanguine, choleric, melancholy, or phlegmatic. Or we’re lions, golden retrievers, beavers, and otters. Or we’re ESTJs and INFPs and everything in between. Once you know that Eights (the challenger) are commanding, confrontational, and afraid of being vulnerable, the analysis writes itself. This post is for informational and research purposes and is not an endorsement of The Gospel Coalition.